Small confession, my husband Scott and I have become obsessed with burrata cheese from Italy. Yes I know that Italy is not a region in France and that burrata cheese may be an unusual choice for French Fridays but this Friday it’s on the menu. Burrata is a fresh tasting rich creamy cheese with an intense milky flavor which can be served drizzled with a little extra virgin olive oil much like fresh mozzarella cheese. In fact burrata is made from mozzarella and cream, the outer shell is mozzarella and the creamy inside is made by adding cream to the left over scraps of mozzarella. We found it on the menu at A16 in San Francisco where it is served plain with crostini and now pretty much order it every time we see it. So last Saturday when I discovered it on the take out menu from Rosso Pizzeria at the Santa Rosa farmers market I admit to becoming a little giddy especially since the salad recipe this week for French Fridays with Dorie called for either mozzarella or burrata cheese. So of course it was my duty to buy the burrata to use for Dorie’s salad recipe. The Saturday morning Santa Rosa farmers market is a big buzzing market with what seems like more vendors and booths every week. A few weeks ago I brought home herbs for my garden and last week I found red amaranth at the farmers market, an herb you don’t normally see that has a slightly bitter beet like flavor which I hoped would offer an interesting contrast to the creamy burrata cheese. I have to apologize for posting two recipes in a row (Goat Cheese Muffins with Scallions and Chives-earlier this week) that featured creamy centers that I did not photograph showing off their interiors. I have no excuse other than thinking more about eating than photographing, we were hungry! In my defense I do think the exterior of this burrata cheese is interesting because you can see the envelope of mozzarella cheese in nice detail. Here is a link to a photo of a burrata that someone remembered to cut open, just scroll down to see the creamy indulgence. 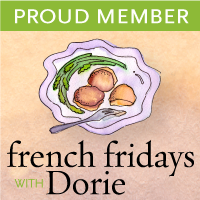 French Fridays with Dorie is an online cooking group that I have been participating in since March of this year. We are cooking our way through Around My French Table by Dorie Greenspan. 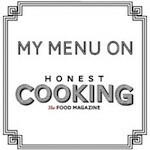 We have been asked not to give the recipes for the dishes we make but to refer you to the cookbook for the recipes, which is one you should consider adding to your collection. Please check out the other contributors hereat French Fridays with Dorie. Truly beautiful, Patty! Thanks for the explanation of Burrata – I was wondering what it is. Now that I know, I've got to try it! This one was a hit, wasn't it? I'm hooked on burrata also – can't believe it's taken me so long to find it. Gorgeous photos! Firstly my dear, you never have to apologize for posting two recipes in a row. Pictures or not, I think we can all agree that it was our gain. Secondly, holy COW! I want that cheese! Thanks for including the link. That DOES look creamy and delicious, something definitely to savor. Paired with the beautiful tomato and strawberry salad, this dish is a definitely winner. Lastly, when are you moving here so I can bum off all these beautiful dishes that you keep tempting me with? Teehee. Have a lovely weekend, my dear! Patty, your presentation is making me want to jump through my monitor! GORGEOUS! I couldn't be more jealous of your beautiful cheese!! What a great twist with the Burrata! It looks fabulous and tasty! Gorgeous photos, Patty … and what an absolutely pleasant salad. We had a rose' with ours, too. Absolutely beautiful photos! I have to search for some burrata, I have never seen it before. Your salad looks delicious! Great post! Have a great week-end! I love burrata cheese as well. Love your pictures, looks awesome! were mixed reviews this week between Tricia and Nana's house. Oh, I love your elegant table setting and plating, with the burrata taking centrestage. I've never seen that cheese before so it's interesting to see what it looks like whole. Also, clever use of red amaranth to offset the creaminess of the cheese. I'd eat your salad in a heartbeat! I love your love for burrata! And your photos are gorgeous. I love your use of setting, instead of being just the food. Actually makes me want a glass of wine… not usual for me so it really is a great photograph! The burrata does look interesting uncut. I will have to try this salad with burrata next time. I also like that you added amaranth – the salad is full of flavour and texture contrasts and a bit of bitterness would make it even more interesting. What a beautiful and elegant salad! Green, red and white…great combination. Stunning photo, Patty! Now I need to find some burrata!!! Oh! How I wish I hunted down some burrata mozzarella! Your salad looks absolutely stunning!!! Gorgeous! I lucked out and found a local source for burrata. It made this salad special. Love the red amaranth with yours. The colors look wonderful. I've never heard of Burrata cheese, but you can bet that now I'll be looking for it. It looks like the perfect accompaniment to your salad! I'm going to try this one, hopefully with the cheese. Wow your presentation is spot on, Patty! It;s beautiful and makes me hungry. I have to go find Burrata cheese! You make me curious about this cheese and its taste. I like creamy mily cheese and this might become one of favorites. Strawberry salad sounds really refreshing and healthy. Perfect for Summer time! Patty-Burrata cheese is to “die for”…creamier, and softer than fresh mozzarella. I knew someone that actually made this cheese at home. The only problem is, you really have to eat it ASAP…it spoils rather quickly. What a fabulous job you did with Dorie's project. So colorful, and flavorful, in every bite, to savor! I've lost count of how many times I've made something and realized only a while later that photographing the meal had completely slipped my mind. Hubby has something to do with my forgetfulness…he is a very enthusiastic eater ;o)…and at times a little impatient with my camera. Patty I am with you..we are also addicted to it. I love Burrata cheese and forgive you for not showing its gooey center! Just looking at the colors and imagining the flavors in this salad has my mouthwatering and my fork ready to dig in! This is so gorgeous Patty, really stunning!